Thomas Wells Pritchard, 71, of Elizabethtown passed peacefully with family by his side on Saturday March 30, 2019. Tom was born August 8, 1947 in Louisville, KY to Colonel (and former Elizabethtown Mayor) James Rhoden Pritchard and Claire Quigley Montgomery Pritchard. Tom graduated from Christ School in North Carolina. In 1972, he earned a BA from WKU. Tom taught at Fort Knox School District for ten years before working for Travelers Insurance Company and later as district manager for a brokerage firm. He spent his retirement hunting and fishing all over the world with friends and family and at the beach with his wife and family. 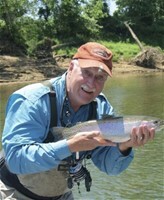 Tom was a tremendous cook, an avid fisherman and hunter, and sports fan- especially soccer and basketball. He enjoyed cheering on his boys and his grandkids in all their endeavors. He could be found in the stands of all EHS Boys Soccer games. Tom dearly loved his family, friends, and dogs. He was the best Grendle, Granddad, Dad, Husband, and Uncling. Tom is survived by his loving wife of 50 years, Glenna; three sons: Thomas R. (Mary) Pritchard of San Antonio, TX, John P. (Jennifer) Pritchard of Charleston, SC, and David M. (Kristy) Pritchard of Elizabethtown, KY; a sister, Katherine Khacki (John) Berry of Arlington, VA and a brother James Jim (Barbara) Pritchard of Selma, AL; 7 grandchildren (Tait, David, Lillian, Presley, Rylee, Nathaniel, and Lincoln) that brought him joy; 7 nieces and nephews that he enjoyed time with at 616, and many wonderful friends. A celebration of life will be held at a later date. Condolences may be expressed online at www.brownfuneral.com.